Once again, we face the Dreaded Morning Scramble: a desperate race against the clock to get the boys scrubbed, changed, fed, and out the door—but not before getting their lunches packed. 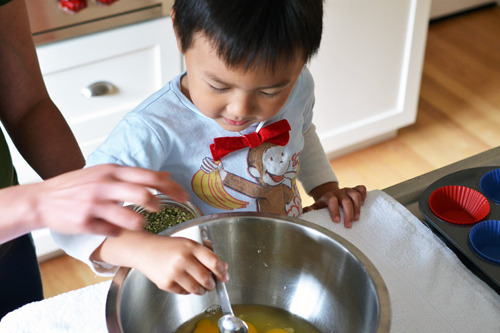 In the chaos of the morning, it can be a frustrating chore to make and pack fun, healthy, and easy mid-day meals. You know the feeling, right? 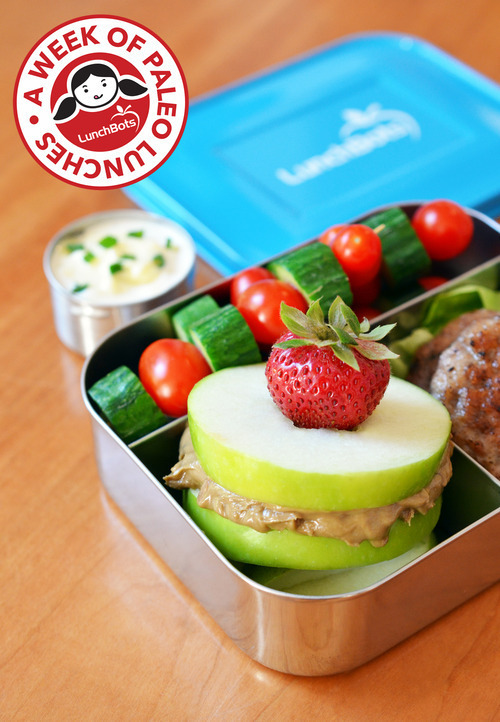 With this in mind, I partnered last year with my buddy Jackie Linder of LunchBots—my favorite stainless steel lunch containers in the world—to come up with a week’s worth of Paleo-friendly packed lunch ideas. (Check out our five-part series here!) 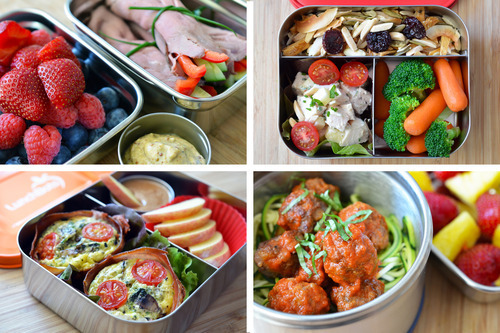 This year, we decided to put our heads together again to whip up another week of Paleo lunches. 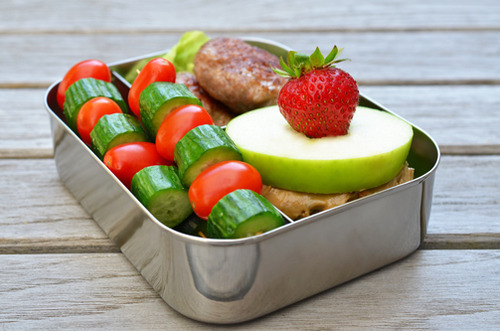 One thing to keep in mind before we kick off our new series of lunches: these are just ideas that are meant to inspire you to pack wholesome, healthful foods in your lunch boxes. Feel free to disregard the specifics, and pack whatever real foods you and your offspring will actually eat. After all, even if you’ve packed the most delicious and nutritious meal possible for your kids, it’ll all be for naught if it ends up in the garbage or traded away for a bag of chips and a can of soda. 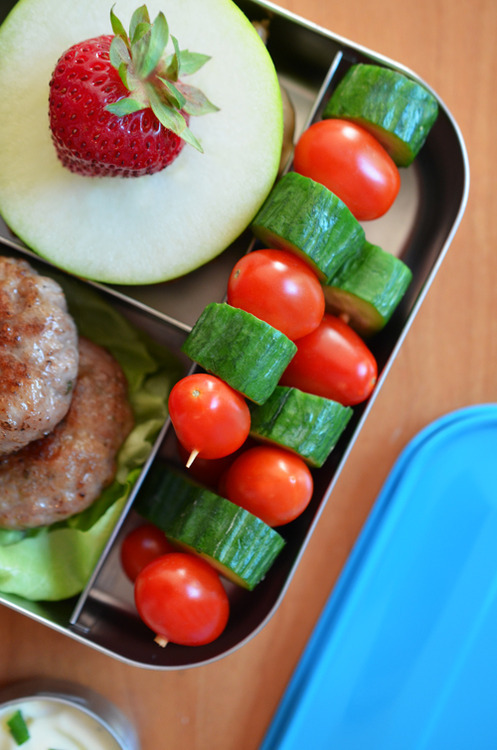 Encourage your little ones to choose their own lunch items from your Paleo-friendly pantry and fridge. And have them help you make their lunches the night before. This way, the food you pack will actually stand a chance of getting eaten. 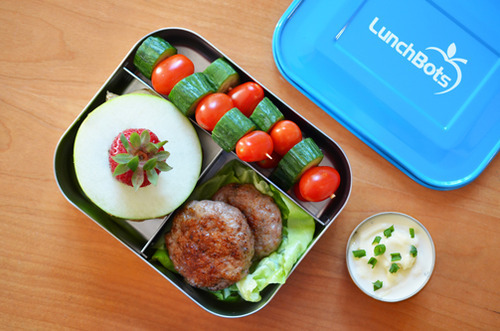 Ready to read about a lunch you can pack tomorrow? This is a super-easy lunch with components that can be made the night before, and with common Paleo pantry ingredients to boot. …and some Paleo-friendly ranch dressing to go with my veggie skewers. 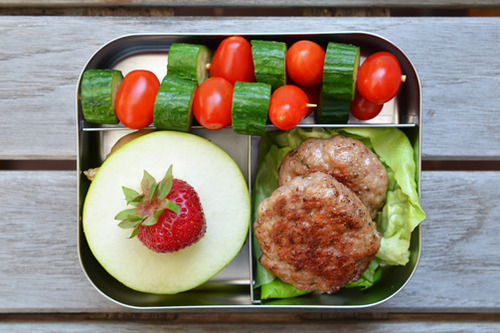 For my lunch box, I used the recipes for Maple Sausage Patties and Paleo Ranch Dressing from my upcoming cookbook (which isn’t out for another few months)—but there are tons of other resources available if you’re in the mood for sausage patties and Paleo-friendly dipping sauces. 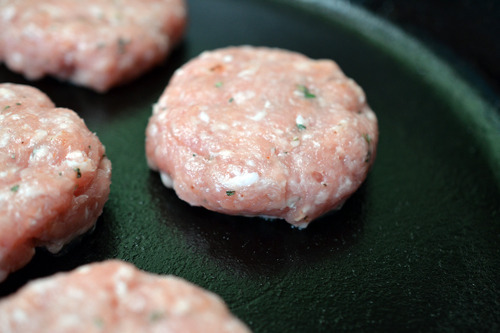 For example, Cook Eat Paleo has a terrific recipe for Paleo Breakfast Sausage, as does The Food Lovers’ Kitchen, the Civilized Caveman, and Jen’s Gone Paleo. 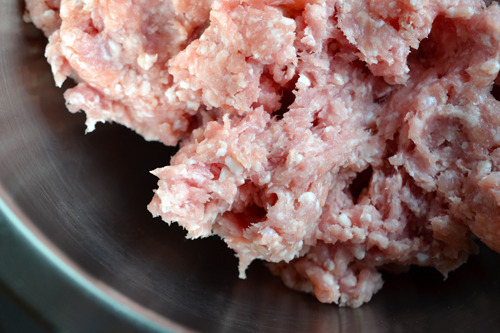 The Paleo Parents have a Licorice Sausage recipe on their site (and a wonderful Maple Sage Breakfast Sausage recipe in their newest book, Beyond Bacon). 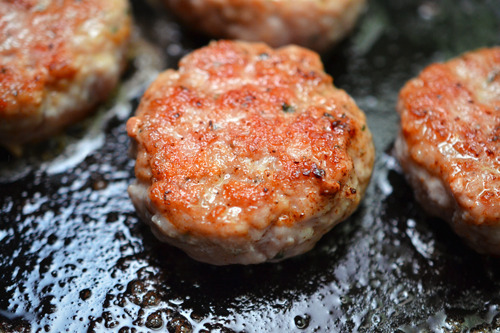 And if you have Diana Rodgers’ Paleo Lunches & Breakfasts on the Go, check out her recipes for Ginger & Spice Breakfast Sausages, Cherry Tarragon Breakfast Sausages, Sweet Apple Spice Breakfast Sausages, and Pear, Sage & Fennel Sausages. 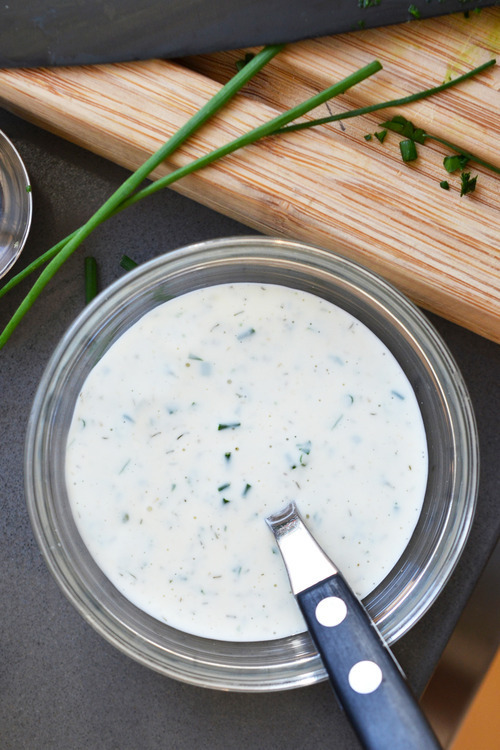 And even though my own Paleo Ranch Dressing recipe won’t be revealed until my cookbook hits shelves, it’s not like there aren’t other awesome versions around. 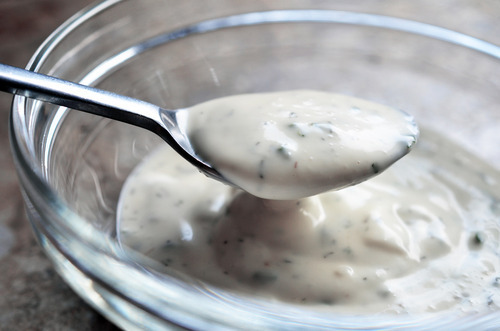 Our Paleo Life has a ranch dressing recipe, and Mark Sisson has a primal take on Creamy Ranch Dressing on his site. And for those of you who have Diana’s book, check out her Happy Valley Ranch Salad Dressing recipe. Not in the mood for ranch dressing? Then re-read my post on Paleo Mayonnaise and try one of the gussied-up mayo-based dipping sauces at the end. Be sure to core the apple, and toss the slices with a bit of lime or lemon juice to keep it from discoloring. 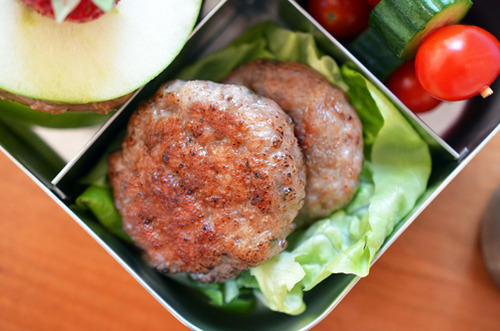 If you want to keep your sausage patties hot, pack them in a hot food container like a LunchBots Thermal. 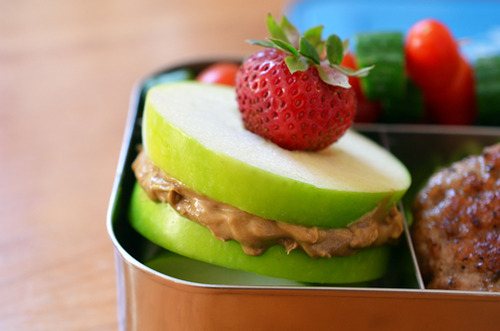 And to keep your cold foods chilly, stick a reusable ice pack or two in the lunch bag next to your food container. Okay, gang—that’s it for today. 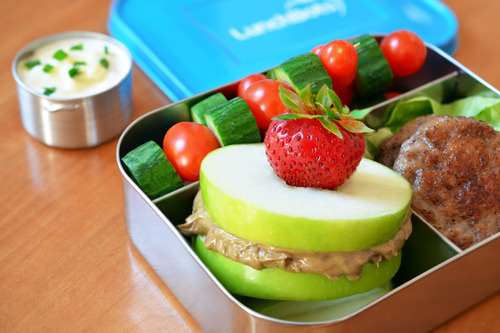 But stay tuned for the rest of our series on Paleo school lunches, and in the meantime, share with us your favorite packed lunch ideas in the comments!